An amazing and highly detailed collectible action figure of Harry Potter! Features Daniel Radcliff's likeness from the Harry Potter and the Prisoner of Azkaban movie. 1:6 scale figure measures about 11 1/4-inches tall. Includes an amazing set of clothes, accessories, and extra parts! 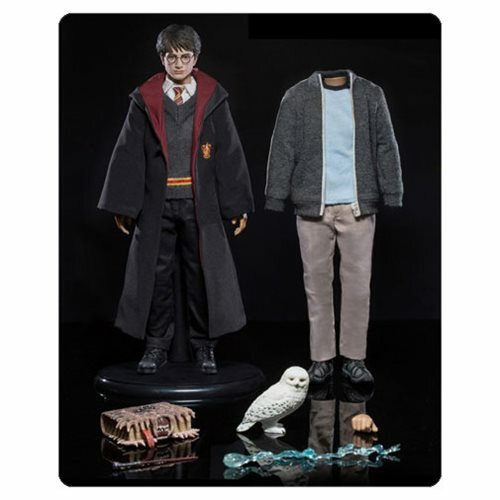 This Harry Potter and the Prisoner of Azkaban Teenage Harry Potter 1:6 Scale Action Figure features a specially hand-painted head sculpt with accurate facial expressions, detailed skin texture, and sculpted hairstyle. Complete with some of the most memorable accessories, this Harry Potter figure includes the Monster Book of Monsters, Hedwig, Harry's wand and 2 fabric outfits! Enjoy 3 extra hands for interacting with his accessories, along with a display stand so that you can pose Harry however you'd like. Revisit the magical world of Harry Potter and his friends this Harry Potter and the Prisoner of Azkaban Teenage Harry Potter 1:6 Scale Action Figure! Ages 15 and up.